Meet Pastor Usani Uguru of Cross River state, The New Minister of Niger Delta. Pastor Usani, Usani Uguru was born in 1961 In Nko, Yakurr Local Government A‎rea of Cross River State. Married with children, Usani is currently a PHD student with the Nigerian Defence Academy, NDA Kaduna State with a thesis topic on Economic Growth and Human Development in Rural Communities of Karu Local Government Area of Nasarawa State. He attended Queen Mary and Westfield College, University of London between 2004 – 2005 were he obtained an M.Sc degree in Globalization and Development. He was a student of Rivers State University of Science and Technology, Port Harcourt between 1998 – 2003 were he also obtained ‎a Masters degree in Environmental Management. An Alumni of University of Calabar, Usani also obtained a Master of Business Administration (MBA) from the school between 1995-1997‎. The ministerial nominee is a graduate of the University of Jos with a Bachelor of Science, B.Sc in Geography and postgraduate Diploma PGD in Management between 1982 and 1986 and 1990-1991 respectively. Usani attended several workshops, seminars and conferences as a resource person and a participant in a wide range of professional sectors including Change Management, Project Evaluation, Speech and Script Writing held in Nigeria, United Arab Emirate UAE and the United Kingdom (UK). Usani Uguru Usani until his new appointment was the Chairman of APC in Cross River State. He was also the state coordinator of National Unity Club (one of the associations that formed the Grassroot Democratic Movement (1994). In 1998 and 1999 when the current political dispensation came into being, Usani was one of the pioneer members who formed the Peoples Democratic Party, PDP in Cross River State, he however left the party in 2001 due to irreconcilable differences within the party, based on principle. He contested the seat of Governorship of Cross River state in 2003 and 2012 under the opposition political platform of National Democrats ND and Action Congress of Nigeria, ACN. He was the Coordinating Director – Fuzel Mining and Construction Company Ltd. 2012 till Date. The challenge of environmental governance: ethical options, at the Centenary conference of the Department of Sociology of the University of Liverpool, UK, 8 – 9 September, 2005. 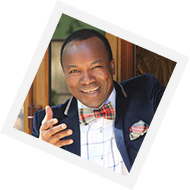 Usani Uguru Usani is a born again Christian and a Pastor who believes in‎ equity, justice and fair play. Usani is seen as a grassroot politician and admired by many people as a man of integrity, probity and accountability. He has traveled far and wide and is an advocate of war against corruption.